Here’s a short quiz designed to determine if you suffer from chronic cookbook compulsion. Answer as honestly as you can – if not detected early this condition can have devastating consequences for your marriage, your job – even your home decor! Oh dear, I’m too ashamed to tell you which answer applies to me, but seeing as I wrote the quiz, I suppose you’ll be able to figure it out. I’ve been drooling over this cookbook in the bookstore for over a year, and felt the time had finally come to drool over a copy of my own. Diana Henry has collected recipes from around all the shores of the Mediterranean for this book, and grouped them by theme, so that every chapter has recipes that share common ingredients and have whimsical names like The Spice Trail, Fruits of Longing, Of Sea and Salt, and Fragrance of the Earth. The recipes are spectacular and unusual; the writing is evocative, poetic and sensual. She recounts personal experiences and anecdotes about the foods she describes; you feel you are experiencing the people, places and history of these foods through the pages of this book before you’ve even tasted the foods. The photographs are vivid and luminous. 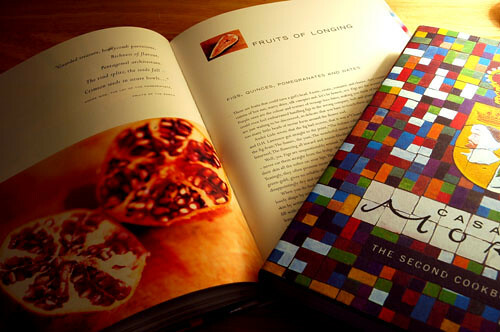 A magical book, a piece of art and inspiration as much as a catalogue of recipes. This book palpably abounds with love – love between the authors and their family, love of the cuisine they describe, and love of their adopted land in the south of Spain. The authors are the husband-and-wife team behind the popular London restaurant Moro, which serves their own particular interpretation of Spanish, North African and Middle Eastern food. This book is their second, and includes both recipes they serve at the restaurant and dishes they’ve learned from their neighbors in the small village in southern Spain where they live part-time. The photographs have a curious washed-out 1950s quality to them; I’ve seen this in other books recently and can’t quite understand it. They’re artistic in their own way, I suppose, but I would rather see food photographed in such luminous and vivid colors that you feel you want to eat the page. The recipes are amazing, however, and there are many of them; they cover much the same ground as Crazy Water, Pickled Lemons, but they seem more rustic and hearty, an impression which is probably helped along by the photographic style. Hi Melissa & Manuel! Thanks for leaving a comment on my blog the other day. I love your site, it’s really beautiful and I think we have quite similar taste on food… I was going to get Crazy Water- and forgot about it (! ), the photographs are beautiful, aren’t they? I love her book called Gastropub Cookbook too (I like Jason Lowe as well). I hope you’ll enjoy the Moro book, I like their first book just as much. Hi Melissa,what a funny coincidence! Believe it or not – I was browsing some blogs during lunch break and stumbled over your (lovely!) blog. Reading point (d) of your little quiz made me laugh out loud – the situation sounded very familiar – but as I had to get back to some urgent work, I made a little reminder note in my timer, quote: “Cookbooks – The Traveler’s Lunchbox – Comment!!! !” Back home and online, who left a comment on our site? YOU! How funny :)Btw, it is a great relief to learn, that there are lots of other cookbook addicts/connoisseurs out there. Looking forward to reading more of your posts! This made me laugh out loud! I’m an all of the above person, embarrassingly enough. I cracked up reading this because I’ve actually been puzzling just recently over how I’m going to afford a new bookshelf, since my books don’t fit at all and the piles are starting to take over my apartment. Since I’m addicted to those fancy hardcover books, I can’t go the cheap bookshelf route either. And I’m completely guilty of hauling new cookbooks to work so I can drool over them – I thought I was the only person in the world to do that.Anyway, I recently discovered this blog, and I absolutely love it. You do a fabulous job. I just bought Crazy Water and am loving it. I have made a few things so far and cannot wait to post about it!